I've always been putting my warchest in POEM money market fund (MMF). Recently, I noticed that the unit price of the MFF had been increasing at an accelerated rate. Fortunately, I had some data that I always recorded when I'm doing my monthly accounts, so I had access to the unit price changes of the MMF every month (most of the time anyway). I needed to know roughly how much interest it will generate so that I can properly allocate to the various instruments for my cash. I keep some liquid cash in normal bank accounts for day to day use and the bulk of the money under the bank accounts is parked in the CIMB fastsaver account. The good thing about that account is that for the first 50k, there will be a 1% interest pa (thereafter is 0.60% pa), fuss-free. There's no hurdles to jump and no credit card spending to clock. I know many people have the hurdled savings accounts with much higher interest, like about 1.8% pa, if they satisfied certain criteria like credit card spending and salary. Since I'm self employed, I don't qualify for the salary part, hence it's such a hassle to jump over all the hoops to reach that the high interest, only to see it fall away when the hoops are raised even higher. Savings bond (SSB) is always a good place to store cash because recent issues has been giving 2% for 1 to 3 yrs, but it is slightly less liquid. MMF takes about 2 working days to cash out, while the cash in banks is immediate. SSB takes a maximum of 1 month, but if you actually apply to cash out towards the end of the month, you really just need 1 week to get the cash out. Hence, it's also a timing issue. As you probably already know, the interest rates had been creeping up from the start of 2018 till now. It's still increasing, but at a slower pace now compared to the start of 2018. Hence, in order to forecast how the MMF's rates is going to be like going forward in 2019, we should look at the latest quarterly rise in the unit price in 2018 to get a gauge. 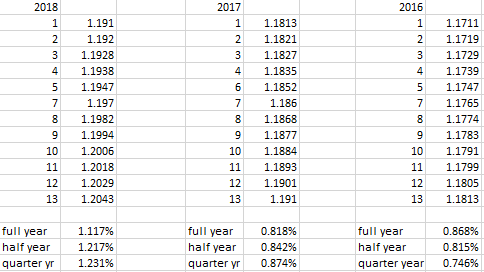 It's 1.231 % pa so I think we can expect the MMF's rate to be around this in 2019. In fact, I expect it to be more than 1.2%. That means it's better than the interest given by the CIMB fast saver account. Well, slightly better with some caveat. There is FDIC deposit insurance for cash parked in banks. For mmf, I don't think there's any. But it's been a pretty safe MMF with nary a drop in unit price since I've been tracking it in 2006. I think the more important thing is about the cap for the 1% interest rate in CIMB. That's only for first 50k, whereas for MMF, there is no cap whatsoever. I need to rejig my current set up. With a kid in tow, I need more emergency cash. And I will need to park them in a place I can't touch easily. The best place right now is SSB. I will also be parking more money into poems MMF since it has higher interest than my bank accounts, doesn't have a cap and makes it easy for me to buy equities (MMF account is linked to shares account). Yet, I also can't keep pumping money into MMF, because what if the MMF goes kaput? There's no insurance for me. So maybe a self imposed cap of 50k in MMF is what I'll do, coupled with a cap of 50k for cimb fast saver account and another self imposed cap of 50k in SSB. Fill up MMF first, then fill up fastsaver, then fill up SSB, in that order. That totals...150k. I don't even have that much cash right now, but at least this exercise makes me think of the hard and soft limit that will be staying with me for the next 3 to 5 yrs I guess. Regarding the 1% for the first 50k, couldn't you create another CIMB account under your wife's name, your child's name, your parent's name, etc to bypass that limitation? I can, but I don't need such measures yet. It's not like I have so much cash floating around having no place to park. If I have maxed out ssb, maxed out my own self imposed limits for MMF, maxed out my voluntary contribution to CPF and still have nothing to buy for a while in the stock market, then I'll do that. I did park some ssb in my wife's account, because SSB had a limit of 100k, and I had used up a bulk of my limit helping my parents buy SSB but parked under my acct. U can consider citibank maxigain. That actually is quite good. actually u can fill up SSB first. SSB interest rate is way higher than CIMB fastsaver. Also, you can get the money out within a month. If you time redemption probably at the end of the month, you can receive the money within 5 working days. Lastly, accrued interest is given too. You know I wrote that in my post right? Where I put my cash is not purely a function of interest alone. The MMF is linked to my share accounts, so I need the money to fire when I need them. Often, waiting till end of the month is too long. The opportunity will be long gone. Hence, there must still be some money in the MMF.